On Tuesday Stephanie posted about vintage skills and it got me thinking… there are a handful of things I’d really like to improve or learn. And since I’m a blogger I figured the next step in my education would be publicly sharing those things with you. My parents are awesome at growing and tending to vegetables and flowers. I hated the outside chores when I was a kid so I didn’t bother learning anything from them. But now I’m feeling that grow-it-yourself vibe and I’ve decided I want a gorgeous garden. I’m going to start small. I’ve planted some indoor seeds already (and they grew!!) and soon K is going to build me a table garden like this one for the backyard. Right, dear? 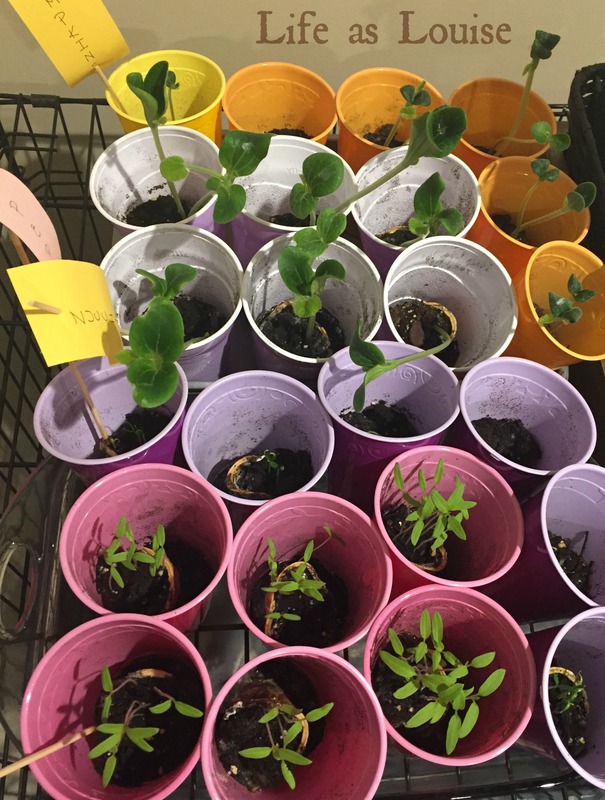 …these are called seedlings, right? Pumpkins, zucchini, tomatoes, & peppers! I have a very basic understanding of German. I took three years of it in high school but the only words/phrases that have stuck over the years have been the things my mom taught us before we went to Switzerland when I was 7. Numbers, yes and no, please and thank you, hello, goodbye, I love you, etc. (well, not the word et cetera…). I spent 4 years playing saxophone and then five years behind mallet instruments (marimba, vibraphone, xylophone). And then I stopped playing music. I don’t know that I’ll ever get back into it, but I wish I had some piano skills- and it’s depressing that my ability to read music has suffered since I stopped performing. I have ZERO excuses. My aunt owns a fabric shop, offers different lessons and retreats and workshops multiple times a week, and she BOUGHT me a sewing machine. She’s amazing and she can literally make anything out of anything. I need to tap into that resource and spend some time with her. 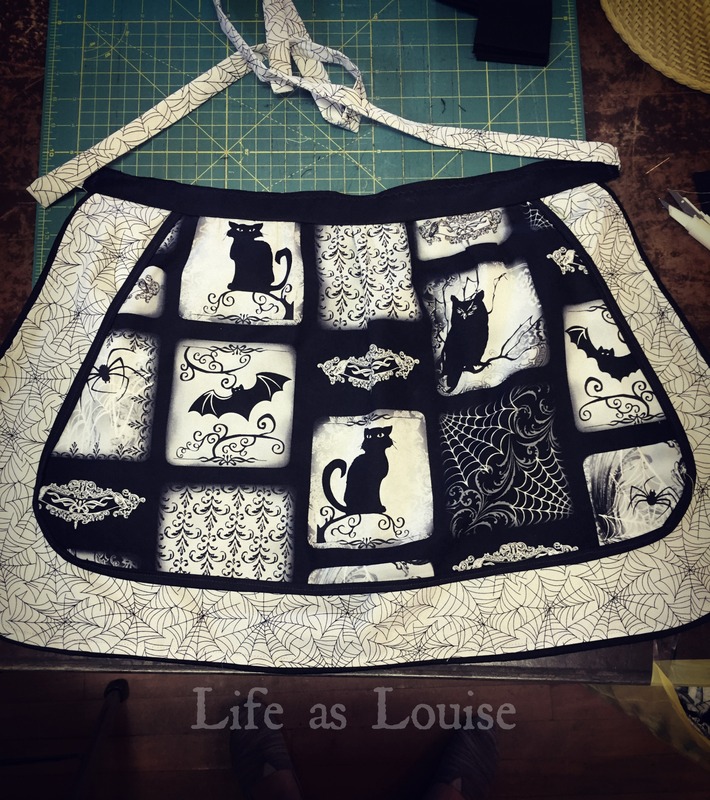 Last time I went to her weekend retreat she (and my mom) helped me make this Halloween apron! My grandma and my husband’s cousin and my mother-in-law’s best friend are all star cake decorators. I’m not shy when it comes to baking or cooking new things, but the last step- the decorating- almost always frustrates me. What are some new skills or hobbies you’re hoping to try? Any tips for me on these five?? Can’t wait to see you learn all these, they sound amazing! What a great resource you have in your aunt, I love that apron. And look at your with your seeds already growing!! I feel like I don’t have enough time in the day to sew (which is a terrible excuse). I really do need to make time to spend some hours with her and better understand the ins and outs of sewing. My family is teasing me because my plants are ready to go “in the ground” and the weather isn’t warm enough yet. Whatevs. I’m just proud they exist, even if they all die. I want space to garden. Originally I wanted a normal garden on the ground, but our dogs loooove digging in dirt so if we have a big exposed patch of it they’d kill everything. I figure a table garden protects my plants from almost all the critters… ha. Yes to all of these things. Yeah… we definitely don’t need any extra cakes or cupcakes or cookies floating around our house. Ha. So many great things to learn! My husband found Duolingo super helpful for improving his German before our trip to Europe. I have Doulingo downloaded on my iPad! I just need to use it! I’m glad he found it helpful- that gives me hope 😉 Lol! “My cat is handsome” is a very useful phrase. Definitely hold on to that one! I just started vegetable gardening a few years ago and it’s really rewarding – my advice is to check out this website for gardening tips and advice: https://www.theartofdoingstuff.com/. I want to learn to play an instrument also. I have a guitar and I took a few lessons years ago but I didn’t practice so I’m pretty much back at square one with that. Thank you! I’ve tried to garden before but I get bored halfway through summer and everything dies. Hopefully that doesn’t happen this year… lol. I would love to learn how to garden and sew and I’m always trying to get better at playing the piano. I’d also like to learn how to make jam. And to bake bread. Well I do know how to bake bread but I wish I did it more often. I have determined that I am not any good at gardening. I would like to try a hand at a little spice garden though. Maybe I would do better at that? I wish I could sew!!! I played flute in middle school and high school and haven’t touched it since. I wish I could play piano and guitar. I have also never made a pie from scratch or bread. I want to accomplish both some time this year. Yay gardening! I grew up gardening with my dad, but I still feel clueless in my own yard. I had a container the last couple years and loved it. It’s not hard at all. I think it will be trickier in our yard with critters and pests and all those things to contend with. My mom always had gorgeous flower beds and my dad always had a great veggie garden… and my brother and I were always stuck pulling weeds in the summer. Lol. It scarred me. The fence and dogs (their scent on everything) do a really good job of keeping the animals out of the yard, but I think a garden is going to tempt them to come in. Sigh. I reeeeeeeeeally want to grow more seasonings (is that what they’re called?) like cilantro and such! I have basil growing on my windowsill right now (thanks to Aldi having little potted basil plants for $2! ), but I want to add to that! Also. Sewing is NO JOKE. Way to go on making such an elaborate apron!! I wouldn’t mind having herbs either. I feel like I need to focus on one at a time, though, or I’ll get overwhelmed and just quit. Hahahaha! I’d love to have mint and parsley and cilantro and basil hanging around, though!! I took German in hs and Japanese in college. (Don’t ask why- I don’t know.) So dumb. I should’ve continued German and tried to improve it. UGH. Definitely steal away! 😉 I have Duolingo downloaded on my iPad and I’ve used it a few times for fun. I think I’m going to keep using it to hopefully improve my German! I’ll definitely have to check out Rachel’s blog for gardening tips and tricks!! Thank you! I am so behind in your posts! But I love this one. I’m currently learning how to garden. We have had one since we moved in and I’ve been getting better and more confident each year. I love canning so gardening is awesome for that obviously. I also desperately want to learn how to sew. I was obsessed when I was younger but never took any classes. This is something I WILL do in the next ten years haha. No worries, lady! You lead a busy life ❤ I love that you garden AND can. I like being friends with canners 😉 I haven't thought about doing it myself. My attention span can only handle one new thing at a time… lol. I can't wait to see what things you make when you start sewing!! ohhhh do you know about ‘how to cake it’ on youtube?! she will give you some SERIOUS #goals when it comes to cake! ravery watches her constantly and it’s really helped him with his cake skills (i mean, hers are really works of art)! i need to learn to cook. like legit. i need to learn to cook a chicken breast to feed myself and my child. Nooooo….. I’m going to need to check out this cake lady on YouTube. Your husband’s snitch cake GAVE ME LIFE. I can only aspire to that… HA. I will definitely check her out! I like baking chicken. It’s like the easiest way to cook it and ensure that it’s done. Haha! I’ve heard that duolingo is a great app for learning languages. I just picked up crochet after wanting to learn how to do it forever! I am still very much a beginner but I was so proud of myself for just starting to learn something new. It’s good for your brain and your confidence! I LOVE that you’ve started crocheting!! Nick’s going to have so many sweaters in his closet once he’s home! Hahaha! Seriously, though, I’d love to be able to make a blanket or scarf! I’d love the patience and skill to garden too! Me, too! Hahahahaha! Usually my dogs get into the gardens I attempt and ruin everything by mid-May. Hopefully a table garden will keep the veggies safe (until crows and deer discover it). Ha.